POLITICS: THIS WRITER BELIEVES THE SURVIVAL OF THE USA BOILS DOWN TO THE PEOPLE VS LIBERALISM WINNER, EVERYTHING ELSE IS SECONDARY. READ "DAYS TO THE USA ECONOMIC COLLAPSE" BY FREDDIE LEE SIRMANS TO SEE HOW THE USA CAN SURVIVE. NOTE: BY HOOK OR CROOK THE SHALLOW MINDED BIAS LIBERAL NEWS MEDIA IS HELL BENT ON TAKING DOWN THIS LEGALLY ELECTED PRESIDENT IN THIS WRITER'S VIEW. THE ONLY SOLUTION I SEE IS TO VOTE THESE LIBERALS OUT IF WE WANT TO SAVE THE USA; OTHERWISE WE ARE DOOMED, PERIOD. COMMON SENSE AND SOUND JUDGMENT IS LIKE BABBLE TO MOST LIBERALS, NOT ALL BUT MOST OF THEM ARE JUST PLAIN WEAK ON COMMON SENSE AND SOUND JUDGMENT. The real true fact of the matter is its liberals and liberalism that is really out of touch with reality and living in fantasyland. I have been saying for years that most liberals have a real problem distinguishing what is real from what is unreal. I say screw you if you can’t take a joke. It has gotten to the point that comedians don’t want to entertain on college campuses anymore. It is the welfare state that is breeding all of these liberals and liberalism. I saw on TV myself Trump jokingly telling the Russians to release the emails if they have them; no one with an ounce of common sense and sound judgment took that as for real or serious. In tone and jest it was just plain humor, yet most liberals took it as dead serious and viewed Trump as a true threat. I'm telling you people that lack a sense of humor are dangerous and can't be trusted in my view. It is like in a communist or authoritarian country where the government views nothing as funny and one laugh may be your last. Before the "New Deal" and the come about of the USA welfare state about the only place you could find a real true bleeding heart liberal was from a rich family, or maybe on an Ivy League college campus. Now, they are coming out of the wood works and from everywhere. Common sense, sound judgment, and a strong survival instinct are things that can’t be taught or found in a book, these are the things that comes only with exercising responsibility and accountability and experiencing a certain amount hardship and struggle along the way, period. Never in history have the poor ever been liberal and morally corrupt before the USA welfare state came about, but today a high percentage of the poor are liberal and killing more babies in the womb than any other demographic group, and especially the African American poor. In this writer’s view the biggest problem in the USA today has nothing to do with race. I believe the biggest problem in the USA today is out of control run-away liberalism, which is due to a lack of individual responsibility and accountability. Today most liberals can’t tell the difference between individual responsibility, individual accountability, and racism. The responsibility and accountability of teaching our very young proper norms and traditions for the most part was lost when they enacted the 1938 socialist minimum wage law. Now, after around four generations very few know what proper norms and traditions are. Today most shallow minded liberals believe if anyone stands up for individual responsibility and accountability they must be a racist, duh, the liberal inmates is now running the asylum. Sure, there is racism in America. And it always has and always will be racism in America to some degree as long as we have different races. But, with the almost unlimited amount of individual freedom we all have in America today no one with self-pride and an “I can do” attitude can be held down for long. It is like winning ballgames in sports, the refereeing is a factor and sometimes they make bad calls, but true winners never focus and dwell on the negative. It is the same thing with racism, you don’t focus and dwell on the negative, you move past it. It is far more important on what one is going to do for him/her self than blaming the system and everything else under the sun in this imperfect world. FREDDIE LEE SIRMANS LOG: 28 AUGUST 2017, 2205 HOURS. THE U. S. SENATE FILIBUSTER RULE DAYS ARE NUMBERED!!! Somebody needs to explain the facts about the role of the U. S. senate in terms of states rights. I wrote many years ago that the people gave up their real power when they allowed the government to seize the social and family provider role for its self. Whoever is the provider is the real boss and has the final say like it or not. And on the other hand the states also gave up their real power by enacting the seventeenth amendment. Before the seventeenth amendment state governors and legislatures exercised almost total control over their two appointed senators. When senators were appointed they answered to their state governor and state legislature and didn’t need to depend on special interest to get reelected. Sure, it was extremely political and bitter on who would be appointed, so the states took the course of least resistance and decided to let the people decide. Constitutional-wise U. S. representatives were primarily designed to represent the people in congress, and U. S. senators were primarily designed to represent the states in congress. In this writer’s view the senate filibuster rule days are numbered because if the republicans doesn’t end it, when the Dem’s get back in power they certainly will. How in the hell can the states maintain a check on an all powerful out of control run-a-way big government when it can't control it's own two senators. PS: No one truly knows, but this writer will take a shot in the dark and say: There is a better than 60 percent chance that the senate republicans will go over the 60 mark in 2018. FREDDIE LEE SIRMANS LOG: 23 AUGUST 2017, 2353 HOURS. THE WELFARE STATE HAS TURNED THE USA INTO A NATION OF NEGATIVE UNGRATEFULLY SELF-CENTERED IDIOTS, IJSMDH. I have hired and provided jobs for people and know what it is like to struggle to make payroll when operating a business. How many of all of these self-righteous know-it-all people that ought to be counting their blessings ever sacrificed or done anything to help this nation survive. We live in a nation with the most individual freedom and opportunity found anywhere on earth. Yet, we find hoards of people blaming any and everything under the sun but the real cause, which is the man/woman in the mirror for all of their shortcomings. If you won't do for yourself you haven't earned it and certainly don't deserve it, period. Sure, everyone sooner or later is going to need help from someone in life, but today far too many people don't really want a helping hand they want to be given a crutch to lean on for for the rest of their life. Minimum wage laws and welfare states is what's destroying western culture, morals, and our nuclear family foundation, not terrorist or any other invading enemy. 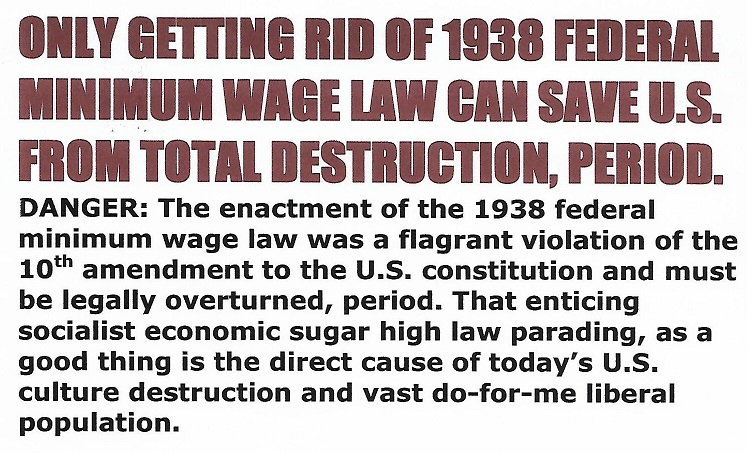 The 1938 USA minimum wage law must be repealed before it is too late. The west is so internally corrupted it can't survive without immigration, period. The opioid problem alone speaks volumes, the military and manufacturing can't use people strung out on illegal mind-altering drugs. F. L. SIRMANS LOG: 18 AUGUST 2017, 2155 HOURS. GREAT WRITER FREDDIE L SIRMANS FEELS THE END OF THE USA MAY BE NEAR!!! I have tried not to comment on all of this self-righteous and who may or may not be a racist. I love this country, but I also believe in constructive criticism. I’ve said it before and will say it again; I don’t think nothing is a bigger threat to the survival of the USA than the out of control liberalism that is running rampart today, not even a nuclear threat or anything else that I can imagine is more dangerous. The country is at the point of being ungovernable by anyone except a media placating weak big government sugar daddy liberal. Extreme liberalism is out of control and running wild. The country is super high on emotionalism and true common sense and sound judgment is all but drowned out by political correction and racialism charges. We can forget about any bright future for the USA until extreme liberalism is reined in, period. If nothing else Trump is flushing out the political hypocrites and snakes that have been hiding their true color for years. F. L. SIRMANS LOG: 16 AUGUST 2017, 1748 HOURS. IT IS A SAD FACT THAT OVER 90 PERCENT OF THE AMERICAN PEOPLE CAN’T SEE THE DESTRUCTIVE POWER OF OUR MINIMUM WAGE LAW. I, as a self-made crude neurotic writer have been drum beating on the destructive power of the USA arch-evil 1938 socialist minimum wage law for a long time, now. And it has been like beating my head up against a brick wall, which any normal writer would have long ago thrown in the towel. I feel like the wood chopper, many times I have wished that I could just give up and walk away, but I feel it is my destiny to keep sounding the emergency distress call alarm to help save my beloved nation even if no one will listen. The main problem I face in getting anyone to see the logic of getting rid of the minimum wage law is perspective and wisdom to see the entire picture as a whole. By the way the wood chopper after swinging his great axe many times to split a mighty oak block just tossed his axe aside and decided to give up and walk away feeling he had totally failed. He could not see any results but before walking away he decided to kneel down for a closer look and to his surprise he could see the beginning of a small split. The moral of the story is no positive human effort is a total waste. Sometimes the right advice can change ones whole attitude, I remember when I was a young Airman in the military a Sgt. Williams said something that changed my whole attitude. I had become overly defensively and thinking I was getting too many raw deal. And one day I was bitching to Sgt. Williams and he said to me “Freddie you see all of these people around here, these people have eyes and if you are being mistreated everyone can see it”. I got rid of my overly defensively attitude from that day on. My high school basketball coach said something over sixty years ago that I have never forgotten, the team seemed too impatience to settle down and set up the plays properly, he said something obvious and very simple “The other team can’t score when we have the ball”. Well, in economic terms a merchant can’t price the cost of his goods more than the poor and middle class can afford and still stay in business. That is the rule and law on understanding basic free market place economic (meaning you can’t get blood out of a turnip). And that law stands through hell and high waters unless government goes into competition against the working poor and middle class by giving cash to non-workers on an individual basis. In a true free market place economy the poor and middle class workers ability to pay is what sets the prices of goods, but when government pays non-workers on an individual basis that supplies enough guarantied customers so the merchant can say screw you working poor and middle class. The government should stick with taking a small amount of profit for internal and external defense and the very few things the people can't do for themselves. That way the seller and the buyer will maintain a natural balance and prices can't get out of hand. To protect the economy the government must never become a social and family provider unless it is going to provides its own commissaries, clinics, and housing units itself. Anyway, so here we are making more and more inflated money that has less and less buying power. And even worse this whole process has all but totally destroyed our culture, moral standards, and our nuclear family foundation. As for the minimum wage law, none of this almost total destruction could have taken place without the full nelson choke hold it has on the USA free market place economy. Amen. F. L. SIRMANS LOG: 13 AUGUST 2017, 2206 HOURS.